It's been a little over a month since I posted about trying to slow down on spending in preparation of buying a house, so I thought I would check in and let you know how it's been going. I've tried spending bans many times before and they never stuck, but I'm pleased to say I think I've actually done really well, and I've surprised myself with how well I stuck to it. The first couple weeks were the hardest - I had honestly been ordering and receiving packages from Sephora or other beauty websites at least once per week. It was hard to get used to not coming home to exciting packages waiting by the door. But that feeling passed, and rather than looking forward to material things, I looked forward to spending my evenings hanging out with Brett and Lilo - saving money and cherishing time with loved ones is a win-win, wouldn't you say? Because of this constant influx of new products, I never had to struggle to think of new blogposts. But once that stream stopped, I had the worst writer's block I think I've ever had. I got so used to writing about new things that I didn't know how to blog about what I already had anymore. I took a week off from blogging while I was on vacation, and I think that time away helped. Now I'm finally getting back into the swing of it - I've got several ideas and drafted posts ready to go, and it feels good. When I stopped buying so many products, I also gave myself more time to really use and get familiar with PR samples I've been sent - I've always been incredibly grateful for the opportunities blogging has given me, and I'm glad to not have a backlog of products to try/review now. As you can imagine, it was getting hard for me to stick to any kind of routine and I changed up the products I used on an almost daily basis. 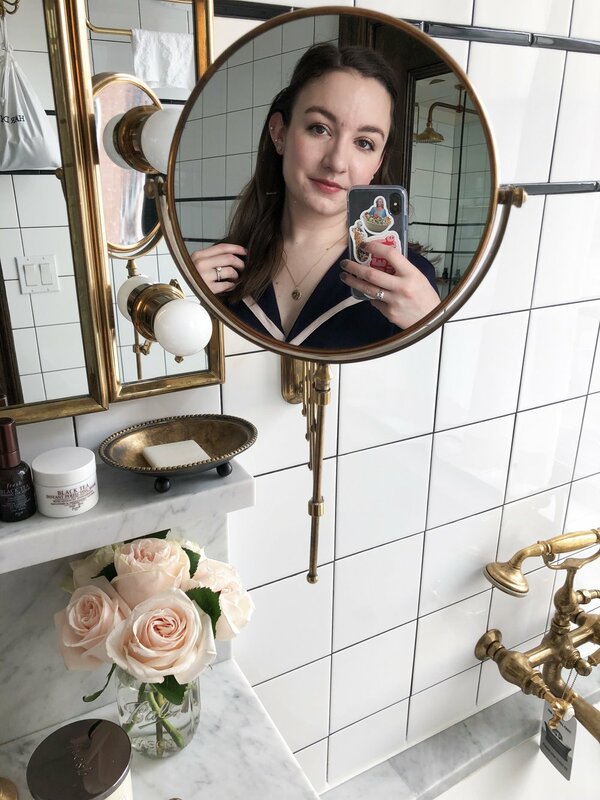 Now, I've been using a fairly constant lineup of products, and I've been able to really discern what works together and what doesn't, and my skin and makeup are looking better because of it. Trying new products is still fun, but I love having a solid core of products I really trust and can depend upon (spoiler: it's basically all Glossier). I'm hoping this is a lasting effect, but actually stopping myself from ordering something the second I decided I wanted it taught me to really think about the money I was spending, and if the product in question was something I really wanted and would use in the long run. The wishlist tip from my original post was a godsend here - I was constantly adding and then scratching out entries as I realized it wasn't something I really wanted. I think the biggest problem with my spending bans in the past were that I tried to go absolutely cold turkey, and then when I failed, I'd just think "oh well it's over now" and go back to my wild spending. This time, I allowed myself a couple little things here and there, and it really helped. Again, it really helped me think each purchase through. I had promised myself I could order a couple of the new Bite Liquid Lipsticks when they launched, and besides that I haven't ordered anything else until today, when I made a small Sephora order to finally replenish my Milk Makeup Flex Concealer - even that took a lot of thought, and it was something I "needed." And to celebrate a little bit that I had a great few weeks in terms of Glossier orders (thank you!! ), I treated myself to a Lancome Juicy Shaker in Cherry Symphony, which has been on my wishlist since the beginning of July (and this post on Instagram definitely ensured it stayed on my wishlist that whole time). I've really surprised myself, and I think I'm going to go forward being a lot more mindful about my spending - and as I'm still broke, the ban will continue indefinitely! Have you tried a spending ban before?